Windy Weather Warning Extended. The weather warning in place for strong winds has been extended until Friday evening. Spain’s national weather agency AEMET has extended the weather warning for strong winds on the Costa Del Sol until Friday evening. An orange alert is in place today. This will be downgraded to a yellow alert for Thursday and Friday. 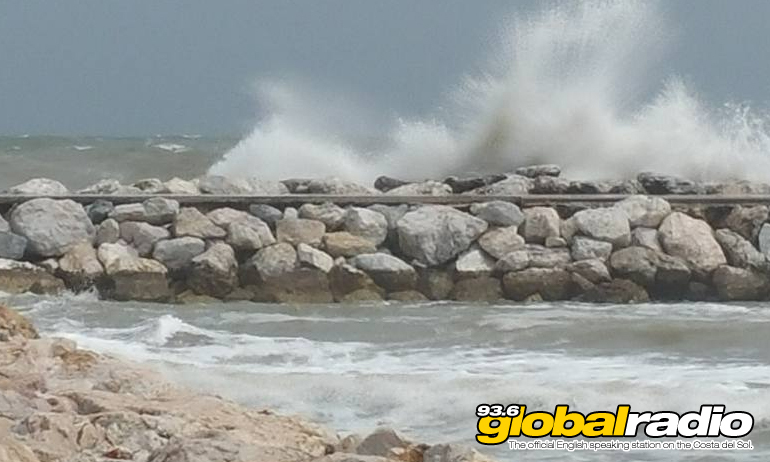 This morning Malaga port was battered by five metre waves. 250 fishing boats have been prevented from sailing by the strong winds, and several beaches around Malaga have reported flooding. Adverse weather conditions can sometimes cause delays at Malaga airport. Check which flights are affected with out live flight tracker here. Yellow: Be aware. Severe weather is possible over the next few days and could affect people in the concerned area. Yellow means that you should plan ahead thinking about possible travel delays, or the disruption of your day-to-day activities. Orange: Be prepared. There is an increased likelihood of bad weather affecting people in the concerned area, which could potentially disrupt people’s plans and possibly cause travel delays, road and rail closures, interruption to power and the potential risk to life and property. Red: Take action. Extreme weather is expected. Red means people in the concerned areas should take action now to keep themselves and others safe from the impact of the weather. Widespread damage, travel and power disruption and risk to life is likely. Keep up to date with all the latest news from the Costa del Sol with the coast’s official English speaking radio station, 93.6 Global Radio. English and Spanish children caught up in a potential tragedy as game goes horribly wrong. British police are “extremely concerned” about Daniel and Liam Poole. Temperatures will soar to 28c by the end of the week.